Three-year-old colt BLITZKRIEG became the 20th individual first crop winner for SEA THE MOON when winning over 9f at Prague on Monday. Bred and owned by Valentin Bukhtoyarov, the colt was having his third start and won by five lengths. Please click here to see the race. Remaining March arrivals include no fewer than four colts by SEA THE MOON, whose first crop three-year-old’s have great expectations held for them this year following their excellent showing as juveniles in 2018. Proven producers DIABLERETTE (three parts sister to Group 1 winner LADY JANE DIGBY and who has bred three winners and the promising three-year-old colt PONDUS to date) and KINETICA, a Listed winner whose first two foals are winners, both have bay colts, as does SELENOGRAPHY, a young unraced daughter of SELKIRK. The fourth SEA THE MOON is a chesnut half-brother out of CLAIOMH SOLAIS to PROUD SKY, a three-time winner, including in 2019, in Hong Kong. CLAIOMH SOLAIS will return to SEA THE MOON. Also visiting SEA THE MOON are ALINSTANTE, a Timeform 100+ three-time juvenile winner by ARCHIPENKO, who has a grey second foal colt by MASTERCRAFTSMAN, and AKRANTI, an unraced daughter of Gr.3 Blue Wind Stakes winner AKDARENA, who has produced a first foal colt by BOBBY’S KITTEN. Another arrival by BOBBY’S KITTEN is the bay filly out of HELVETIA, the mare’s third produce following the now two-year-old filly AROSIENNE and yearling colt, who are both by ARCHIPENKO. Meanwhile ARCHIPENKO’s Gr.1 Champion Fillies and Mares Stakes winning daughter MADAME CHIANG has a third foal daughter by LOPE DE VEGA, her third filly in as many foals. Her first produce, the two-year-old KINGMAN filly ORIENTAL MYSTIQUE, is in training with MADAME CHIANG’s handler David Simcock while her yearling is a bay daughter of INVINCIBLE SPIRIT. Another daughter of ARCHIPENKO, KANDAHARI, a two-time winner herself from the family of SELKIRK’s Italian Champion son ALTIERI, has a first foal filly by SIR PERCY. The filly is closely related to SIR PERCY’s Lanwades-bred dual French Listed winning daughter PERSONA GRATA, who happens to be a half-sister to KANDAHARI’s dam KESARA. KANDAHARI will return to SIR PERCY. Two new arrivals are colts by Classic-winning sons of GALILEO. LA VIE EN ROSE, a winning daughter of Group 1 winner LADY JANE DIGBY, has a first foal colt by Derby winner AUSTRALIA, while SO IN LOVE, a Stakes-placed winning fourth-generation Lanwades homebred, has a first-colt third foal by 2000 Guineas winner GLENEAGLES after fillies by SEA THE STARS (SPICE OF LIFE) and SEA THE MOON (STAGIAIRE), three-year-old and two-year-old respectively and both with Ralph Beckett. Both of these mares will visit BOBBY’S KITTEN this year, as will SO IN LOVE’s close relative SUNSET SHORE, a juvenile winner herself and whose first foal is also a two-year-old winner and who has this year produced a grey filly by GUTAIFAN. Across the Atlantic at Gainesway Farm in Kentucky KARAMELA, an Airlie Stud-bred daughter of MASTERCRAFTSMAN out of a half-sister to Irish 2000 Guineas winner BACHELOR DUKE, tracing to SPECIAL’s full-sister LISADELL, has a grey colt by Champion sire KITTEN’S JOY, her second live foal following a chesnut colt born last year by 2016 Kentucky Derby winner NYQUIST. KARAMELA herself is a half-sister to the Lanwades & Staffordstown Studs Silken Glider Stakes (Listed) winner, GEMSTONE – dam of impressive Wood Ditton Stakes debut winner UAE JEWEL at the Newmarket Craven Meeting. On the opening day of the Craven Meeting at Newmarket it was Lanwades-bred SHINE SO BRIGHT that won the Listed Free Handicap in convincing style. The son of OASIS DREAM broke well, got the rail and led a good gallop and went onto to score by a length and three quarters. Bred by Lanwades Stud he is out of ALLA SPERANZA, herself a Group 3 winner by SIR PERCY. He was first sold at the Tattersalls December Sales as a foal, then as a yearling at Goffs Orby Sale. He won first time out for Karl Burke and was then sold to King Power Racing at the Goffs London Sale for £375,000 and finished 5th in Gr.2 Coventry Stakes. He was then transferred to Andrew Balding's yard and finished 3rd in three Gr.2's as a juvenile before winning this race on his reappearance as a three-year-old. Two mother and daughter combos and a pair of Group-winning sibling great-granddaughters, all descendants of ALRUCCABA’s World Champion granddaughter ALBORADA, are amongst Lanwades’ early and mid-March arrivals. ALVARITA, Listed-winning daughter of SELKIRK and ALBORADA, and who already numbers Group winner ALLA SPERANZA (by SIR PERCY) and Listed scorer ALTESSE (by HERNANDO) among her six winners, has a bay colt by MUHARAAR, the Champion sprinter whose first crop races this year. Her daughter ALBORETTA, a winning full-sister to ALTESSE, has a BOBBY’S KITTEN filly, her third foal, and third filly following last year’s BOBBY’S KITTEN full-sister to this one and 2017’s WORTHADD filly ALIANNE, a now two-year-old in training with Tom Clover. Aforementioned ALLA SPERANZA, winner of the Group 3 Kilternan Stakes at Leopardstown at three, arrived very late to the March party, foaling a grey filly by SEA THE STARS on the 31st. She is dam already of the highly-promising Andrew Balding-trained SHINE SO BRIGHT, a winner and placed three times at Group 2 level in just five starts at two last year, while she also has to run for her this year ALLA LUNA, a two-year-old SEA THE MOON filly who is with Jim Bolger. ALVARITA’s GALILEO daughter ALMIRANTA is dam of Group winners ALEA IACTA and ALYSSA with her first two foals, and these siblings produced filly foals on consecutive days. Park Hill Stakes winner ALYSSA (by SIR PERCY) has an INVINCIBLE SPIRIT first foal. While her Prix Thomas Bryon-winning sister ALEA IACTA, who is by INVINCIBLE SPIRIT, has produced a third foal daughter by SEA THE MOON. The other mother and daughter combination to foal are ALMAMIA and ALAMODE. ALBORADA’s HERNANDO daughter ALMAMIA has a chesnut colt by Group 1 winning INVINCIBLE SPIRIT horse NATIONAL DEFENSE (his first crop are now foals); her SIR PERCY daughter, a winner and runner-up in the Gr.3 Oh So Sharp Stakes at Newmarket at two, has a chesnut daughter by POSTPONED to follow last year’s first foal SEA THE STARS filly. A rush of foals in the second half of February include no fewer than five arrivals - three fillies, two colts - from the second crop of Lanwades' Breeders' Cup winner BOBBY'S KITTEN. First of the five-strong "litter" to arrive was the chesnut daughter of HEAT OF THE NIGHT, born within days of the win in Naples of her three-year-old half-brother ZONA CESARINI, who was adding a quick follow-up win to his juvenile success at the backend of 2018. The filly is also half-sister to another three winners, including HERE TO ETERNITY, dam of ARCHIPENKO's Hong Kong Group 1 winning full-brothers TIME WARP and GLORIOUS FOREVER. The other two BOBBY’S KITTEN fillies are both second foals, one out of Timeform 104-rated SEYCHELLOISE, a daughter of PIVOTAL and Group 3 winner STARLIT SANDS whose first foal is a now yearling colt by SEA THE STARS, the other a half-sister to last year's THE GURKHA filly out of three-time winner WAVELET, an ARCHIPENKO granddaughter of European Champion filly RAMRUMA. BOBBY’S KITTEN's two colts are a tenth live foal for HERNANDO's Group 2 winning daughter SAMANDO, all seven of whose produce to have raced to date are winners; and a second foal for FRESH STRIKE, a winning daughter of SMART STRIKE who traces to FALL ASPEN and whose winning two-year-old half-brother SHAMAN was also second and third in Listed and Group races in Paris in 2018. NADESZHDA, a NASHWAN great, great granddaughter of SPECIAL who is already dam of five winners, has a bay filly from the first crop by DUBAWI's multiple Group winner TIME TEST; and CATADUPA, a SELKIRK full-sister to dual Group winner CUBANITA, also has a filly by a first season sire, hers a bay daughter of multiple International Group 1 winner HIGHLAND REEL. The remaining two February arrivals are colts by Lanwades sires: Newmarket Listed winner FROSTY WELCOME, a daughter of WITH APPROVAL and another who is dam already of five winners, has a grey son by SEA THE MOON a full brother to the two-year-old filly COLD LIGHT OF DAY; and SHE'S GORGEOUS, a dual-winning daughter of a half-sister to Dubai World Cup winner PRINCE BISHOP, has a second live foal half-brother by SIR PERCY to REINE DU BAL, her already-named 2018 filly by MUKHADRAM. Five new members of the great ALRUCCABA family have taken their first steps into the world in the second half of February, and three of them are out of black-type daughters of German Horse of the Year and triple Group 1 winner ALBANOVA. The headline act amongst them on paper has to be the bay colt by DUBAWI out of three-time Listed winner ALL AT SEA, herself a product of two Horses of the Year given that she is by SEA THE STARS. ALL AT SEA's first foal is the INVINCIBLE SPIRIT two-year-old filly A LA VOILE, who is in training with Sir Michael Stoute, while she also has a yearling filly by ARCHIPENKO. ALL AT SEA's Listed-winning HERNANDO half-sister ALWILDA has a second foal filly by prominent French sire KENDARGENT; her first foal, the FRANKEL two-year-old filly ALPINISTA, is in training with Sir Mark Prescott. And ALL AT SEA’s and ALWILDA's multiple Listed placed GALILEO half-sister ALBAMARA has a bay colt by KODIAC, and he too has a juvenile sibling in training in Newmarket, an OASIS DREAM colt also with Sir Mark Prescott. ALBANOVA's GREEN DESERT half-sister ALTITUDE has foaled a grey filly by BOBBY'S KITTEN. The filly is half-sister to three winners, one of whom is the five-time winning SIR PERCY filly HOPE IS HIGH and another of whom, ALEGRA, is dam of 2018 Listed-winning two-year-old BLUE GARDENIA. ALTITUDE also has the NEW APPROACH filly ALSAMARA in training with HOPE IS HIGH's handler John Berry and the LEROIDESANIMAUX three-year-old filly ALPINE AIR to run for her in 2019. ALGARADE, the fifth of the line with a February foal, and another daughter of GREEN DESERT, has a bay filly by SEA THE MOON, half-sister to two winners, the mare's first two produce, and full-sister to a two-year-old colt in training in Japan. 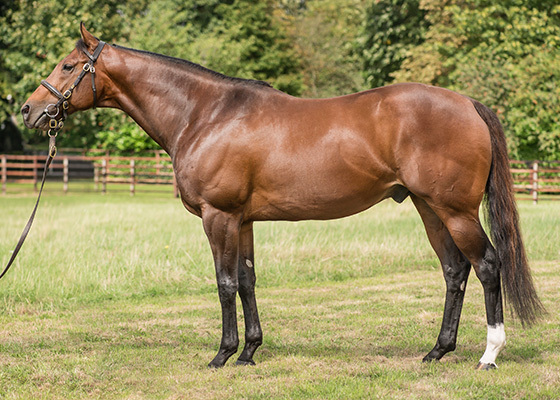 Champion First Season Sire in Germany in 2018 SEA THE MOON sired his seventeenth individual winner and first three-year-old winner when OYAMBRE won well over 2200 metres at Fontainebleu today. SEA THE MOON ended his first season with runners with 16 individual winners including two Group Three winners NOBLE MOON and QUEST THE MOON. NOBLE MOON was crowned Champion two-year-old in Germany in 2018. Early February foals at Lanwades number seven, and the earliest amongst them, born Tuesday 5th, are a pair of fillies by first season sires. Group 1 winner LADY JANE DIGBY has a chesnut daughter by Champion miler CHURCHILL. The mare's first three foals are all winners and she has four-year-old (FRANCOPHILIA by FRANKEL), three-year-old (DAME FREYA STARK, by LEROIDESANIMAUX) and two-year-old (AVENTURIERE, by ARCHIPENKO) daughters to run for her this year, all with Mark Johnston. ALTA MODA, also dam of three winners so far and who has three-year-old daughter (ALEMAGNA by SEA THE MOON), as well as two-year-old daughter (ALCHIMISTA by ARCHIPENKO) both with David Simcock to represent her this year. She has a 2019 bay daughter by the Irish National Stud's new INVINCIBLE SPIRIT horse NATIONAL DEFENSE. ALTA MODA's first winner, Timeform 111 rated GHURAIR, is a winner again this year already at age nine, bringing his tally of US wins to seven. He also won two races at 2 in the UK, including the Tattersalls Millions 2yo Trophy, for a total of £314,000. BEST FRIEND, John Pearce Racing Ltd's unraced GALILEO full-sister to Irish Champion three-year-old filly and triple Group 1 winner LUSH LASHES, has a LOPE DE VEGA colt second foal. She will join LADY JANE DIGBY in visiting SEA THE MOON this year. Two young mares have second crop produce by BOBBY'S KITTEN. ANARCHISTE, Timeform 92 rated daughter of ARCHIPENKO, has a second foal filly. Her first foal, the two-year-old MUKHADRAM filly ANANCY, is in training in Newmarket with Charlie McBride who also trained the dam. SAGESSE, a winning daughter of leading US sire SMART STRIKE and one of 10 winners out of SUMMER NIGHT, has a first foal colt. SAGESSE is a 4th generation Lanwades-bred; she will return to BOBBY’S KITTEN. SELKIRK's six-time winning daughter LEADERENE, half-sister to Gr.1 Prix de l'Opera winner LADY MARIAN, herself dam of 2018 French Group 2 winner LOXLEY, has a colt by SIR PERCY. The bay is her third colt in as many foals following LE DON DE VIE by LEROIDESANIMAUX, who was placed twice at two last year from three outings, and a now yearling colt by GOLDEN HORN. Visiting SIR PERCY this year is MARIEE, a dual-winning daughter of ARCHIPENKO and the SELKIRK mare MARIA DI SCOZIA from the family of LADY JANE DIGBY, following the arrival of her bay colt first foal by SEA THE MOON. Four fillies and one colt make up the five January 2019 foal arrivals at Lanwades. Two of the quintet are first foals for two-year-old winning daughters of ARCHIPENKO. CHINOISERIES, a full-sister to Group 1 British Champions Fillies and Mares Stakes winner MADAME CHIANG, has a grey daughter by MASTERCRAFTSMAN. The other, ARGENTERIE, a granddaughter of Prix de Diane winner and European Champion three-year-old filly LADY IN SILVER has a chesnut filly by BOBBY'S KITTEN. Both these two will visit SEA THE MOON, Lanwades' promising young sire by SEA THE STARS, whose first crop made such a noteworthy start on the track in 2018. ALBA STELLA, a daughter of 2004 Broodmare of the Year ALOUETTE, and ALTESSE, a great-granddaughter of ALOUETTE, through that mare's Champion daughter ALBORADA, both also produced fillies. The former's is a BOBBY'S KITTEN half-sister to eight winners from eight runners including 2018 two-year-old winner ALBANITA (by SEA THE MOON). The IFFRAAJ filly out of Listed winner ALTESSE is the mare's second filly from as many foals following last year's daughter of Champion miler GLENEAGLES. The sole colt arrival is a bay colt third foal (following a filly by SEA THE STARS and a colt by BOBBY'S KITTEN) by SIR PERCY for the unraced NAYEF mare LUISA CALDERON, own sister to German Champion three-year-old filly and Group 1 Prix de l'Opera winner LADY MARIAN and 2018 Gr.2 winner LOXLEY. Lanwades sire SIR PERCY got off to a flying start on the racecourse this year when his daughter PANTSONFIRE won the Gr.3 Astra Stakes at Santa Anita yesterday by some 5 lengths. Bred by Peter Reynolds and Robert Dore, she was purchased at Goffs November Foal Sale and raced in Ireland at two and three when trained by Mrs John Harrington before being transferred to race in the US where she is now trained by Richard Baltas. Before this win she had been previously placed in the Gr.3 Santa Barbara Stakes also at Santa Anita. SIR PERCY is the sire of 45 individual Stakes horses.